This recital takes its title from another major guitar work of the 20th century, Nicholas Maw’s Music of Memory – an intricate set of variations on a theme from Mendelssohn’s String Quartet in A minor. It is coupled with premiere recordings of Maw’s Little Suite for Guitar; Peter Racine Fricker’s dramatic, Spanish-inflected Paseo, commissioned by Julian Bream, but never recorded; and works by Bayan Northcott, John McCabe and Joseph Atkins. Finally, the recording features two new works commissioned by Antonis from Charlotte Bray and Matthew Taylor, with support from the Britten-Pears Foundation. 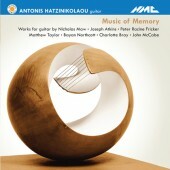 For more details and purchase please visit: NMC Recordings. 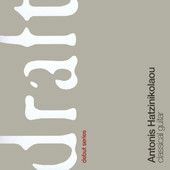 Comprising a recital programme of four major classical works spanning the past four centuries, Antonis Hatzinikolaou’s debut recording in Draft Records represents the culmination of an impressive classical music education involving some of the world’s finest institutions and performers. Featuring: J. S. Bach: Sonata BWV 1005 (arr. Hatzinikolaou), M. Giuliani: Grande Ouverture, B. Britten: Nocturnal op.70 and J. Rodrigo: Sonata Giocosa. 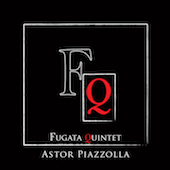 Astor Piazzolla is Fugata Quintet’s debut double album, which, even with its extended 90-minute duration, is only a small illustration of the quintet’s vast repertoire. As an independent group, Fugata Quintet enjoy the opportunity to explore a variety of Piazzolla’s lesser known pieces alongside his more established works. Part one, Concierto de Fugata, with the exception of Adios Nonino, is a selection of lesser known Piazzolla works that challenge their performers’ expressive, improvisatory, and technical abilities. Among the other pieces, Revolucionario, as its name suggests, will keep the casual listener on the edge of their seat while introducing Piazzolla aficionados to a whole new side of his music. Part two, Angel y Diablo, is the realisation of one of the composer’s own programming ideas, which sadly did not materialise during his lifetime due to the then perceived unconventional nature of the musical material. The vivid Angel and Diablo suites are presented here with the addition of the breathtakingly beautiful and poignant Coral. 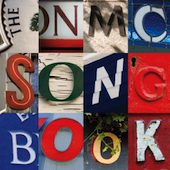 To mark its 20th Anniversary in 2009, NMC Recordings has commissioned the NMC Songbook. Nearly 100 composers, ranging from the UK’s most highly regarded figures to the younger generation of emerging talents, have each written a song on the theme of ‘Britain’, for single voice or duet and a range of accompanying instruments. Antonis has taken part on this project performing works by: Luke Bedford, John McCabe, Jonathan Lloyd, Stuart MacRae, Giles Swayne as well as arrangements of Thomas Morley by Colin Matthews for a variety of ensembles.